'Love is the meaning' is the phrase chosen by the mystic 14th century writer Julian of Norwich to encapsulate all that had been revealed to her in the series of visions that led her to write one of world's greatest spiritual books, her Revelations of Divine Love which continues to inspire countless readers today.Its everyday imagery and warm intimacy set it apart from other great spiritual classics. Ann Lewin uses its homely qualities to provide the basis for an exploration of our own experiences of the spiritual life, and as we search for answers to life's big questions:How can we hold fast to the truth of God's love in the face of suffering and disaster?Does prayer change anything?How can Julian help us to speak freshly about God to our world?What do we do when God seems far away and silent?Can we actually believe that 'all will be well' as Julian did?These and other questions are explored here. 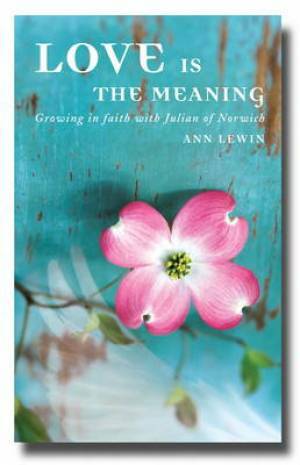 Love is the Meaning by Ann Lewin was published by Canterbury Press in October 2010 and is our 30553rd best seller. The ISBN for Love is the Meaning is 9781848250505. Here are five sessions for a Julian group, or for reading through and meditating on your own. If you should read it on your own, you will benefit by discussing with someone else, what you have read and thought about. Each person in a group needs their own copy, and it is useful to start by reading the Preface and the Introduction, even if you are familiar with Julian’s story and her writings. The sessions are entitled Coping with troubled times; The Nature of God; Prayer; Sin; and the familiar phrase All Shall be well. Each session is followed by suggested questions to ponder, sources of further information, and a suggested form of worship with which to end the session, which is repeated for all five. I had not read through this book before, but was so glad that it had been reprinted enabling yet more people to benefit from Ann Lewin’s guidance. Got a question? No problem! Just click here to ask us about Love is the Meaning.